Lavandin Super (France) - Ultra International B.V.Ultra International B.V. The evolution of 'Super' sits somewhere between 'Abrialis' from the 1920s and 'Grosso' of the 1970's. 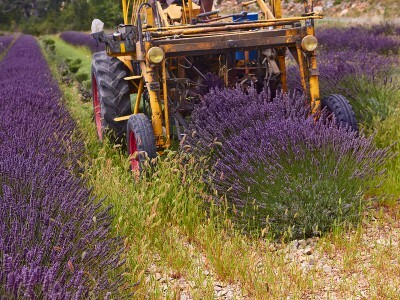 It is a natural hybrid of lavender and spike lavender (lavandula angustifola x spica). Lavandin itself has a history (dating back to the 1820s) of different species all with different compositions. The three most common being ‘Grosso’, ‘Abrialis’ and ‘Super’. In the past, the most common was Abrialis but this has evolved over time with ‘Grosso’ now being the dominant type with over 1,000 MT being produced in France alone each year. Lavandin Super is not aggressively cultivated anymore but is still preferred by some perfumers, as its odour profile can be closer to that of lavender rather than grosso, which has a more camphorous note. Lavandin is said to have a number of therapeutic benefits in particular for its antiseptic, anti-bacterial, anti-fungal and analgesic properties. It is commonly used in muscular pain relief products.